I have been working on these blocks most of this past week. There is a lot of prep work to do before you get to the fun part of putting the blocks together. I hope to work on the other 40 blocks starting today and get the top put together this week. I think it is going to turn out pretty well. Part of doing the prep work has involved creating lots of little HST leftovers and while I was trimming and pressing I came up with a plan for using all of them. I have decided to make a Lady of the Lake quilt. The one downside is that I have used up a lot of my reds so I needed some more. Luckily, my niece and I decided to do a road trip down to Portland on Friday and I got 4 more. 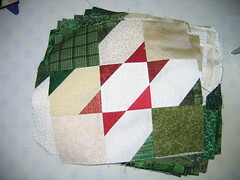 I think I have about 9 or 10 different reds and several greens I can use for the center HSTs for those blocks. I would like to get all the pieces cut out so I can put all the fabric away and get it off my sewing table but I will probably hold off on sewing the blocks until my quilt retreat this fall. On the road trip I also got these black and white fabrics. I have several projects that I need these for but I am really low on them. The white on white has little crabs on it - too cute! I also have a couple of projects that require fall fabrics and my choices in the area were pretty slim also so I fleshed that out a bit with these. I got these three for the strips between the denim pieces is some quilts I will be working on in the next month or so. These are all for some special people in my life. And finally, I don't have a picture of my last two purchases because, while they are exciting, they aren't so exciting to look at: about 8 yards of navy Kona for my Cathedral Window Quilt project and a roll of 120" Warm & Natural so I can get some quilts finished.